Throughout past few years, the IAB and Media Rating Council (MRC) have partnered with leading U.S. advertisers to form the 3MS coalition (Making Measurement Make Sense) with a specific goal of defining and promoting a new standard for display ad viewability. The goal was to eventually replace the current cost per mille (thousand) impressions model with a standard to bill per thousand viewable impressions. The resulting and highly anticipated standard is widely expected to yield the most significant disruptions seen in display ad measurement and pricing across the industry. For those new to the concept of viewability, the IAB standard defines a viewable impression as a display ad unit having at least 50% of its pixels visible within a browser for at least one (1) continuous second. Adosia's Ad View Optimization technology was deployed with an e-commerce publisher during the month of August 2014 with ad placement well below the fold delivering a small sample of ~1M impressions. By default, our Ad View Optimization was able to achieve 85.51% viewability on standard CPM making the below-the-fold placement of ads nearly negligible (Adosia's Ad View Optimization only loads ads once they have an opportunity to be viewable). Though the vCPM on viewable impressions entailed only a 10% premium over Adosia's standard CPM (which yielded the 85.51% viewability by default), the same vCPM campaigns entailed a 17.75% increase in CTR over that achieved using Adosia's standard CPM with Ad View Optimization Technology. When considering an arbitrary viewability rate of sub 50% on below the fold placement with the absence of Adosia's Ad View Optimization Technology, we were excited to understand Adosia's CPM solution would provide a 71% increase in CTR over traditional CPM. 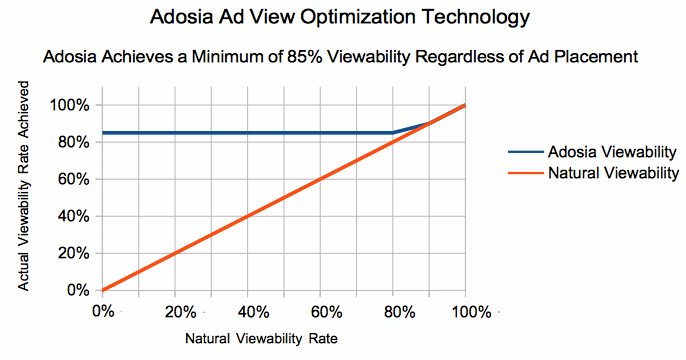 And of course at 50% natural viewability below the fold, Adosia's vCPM solution would yield nearly a 100% increase in CTR over that yielded with traditional CPM campaigns.